What brand of oil would you use for your Regal? Everyone has their preferred brand of oil. So I wanted to find out what is your favorite brand or what brand would you use and possibly why you chose that brand? ive always used mobil 1. whether its conventional or synthetic. i always stick to mobil 1. never had a problem with before so no reason why i should change. Mobile One is suppossed to be fill for the Insignia. Been considering Pennzoil Platinum. Not sure about the turbo, but GS requires DEXOS-approved oil. New Mobil 1 has the logo right on the bottle. The turbo requires Dexos as well. 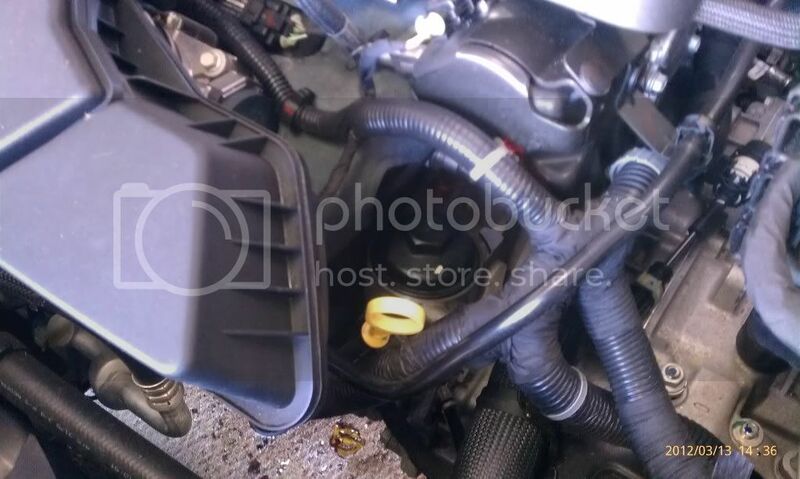 Id like to know where the oil filter housing is ? Pretty sad when the owners manual does not tell you. Advance Auto parts currently has Quaker State "Ultimate Durabilty" (Dexos Licensed) on sale now for $3.99/qt. Quaker State is offering $20 rebate if you purchase 5 quarts. Takes 6 quarts for an oil change. I got in on the deal. 6 quarts for $4.00. I have been using Castrol ever since I started doing my own oil changes. Never read a bad review about them and its worked really well for me so far. I try and get the German made Castrol as its a much better grade than the North American made Castrol. First oil change for ours @ 6330 miles. 37% remaining, just wanted to do the first one or two a little early. If I run Mobile 1 Full Synthetic in my Regal (haven't even had my first oil change yet) how many miles should I be getting between changes? Should I be changing my filter more often (lets say every 5k miles) since I will be able to go 8-10k+ miles? Or do I not have to worry about it on a modern car like the Regal? If I go longer between oil change intervals, do I need to change my oil filter more frequently? Or do I need a special filter? Continue to change your oil filter when you change your engine oil. Special filters or more frequent oil filter changes are not required;, however, some low quality filters may not be capable of protecting your engine throughout an extended oil change interval. Mobil 1 Extended Performance Oil Filters provide outstanding protection during longer oil change intervals - up to 15,000 miles of Guaranteed Protection when combined with fully synthetic motor oils. Mobil 1 Extended Performance Oil Filters are designed to remove more impurities (99.9 percent Multi-Pass Efficiency Test rating) and hold more contaminants (22.5 grams capacity) than conventional oil filters, which make them ideal candidates when oil drain intervals are extended. All new car warranties remain in effect when Mobil 1 Extended Performance Oil Filters are used. Follow your vehicle manufacturer's recommended oil change intervals. Last edited by claimed4all; 03-13-2012 at 03:05 PM. I personally, pick the oil and filter and change interval. Go with it. Then pull a sample and send in for analysis, adjust per results of analysis. Don't know about the regal yet, but in my truck I've been running 10,000 miles with synthetic oil. I used to use Royal Purple but I heard bad things about them plus it caused a knock in my engine. Now I use Castrol too. What engine oil was put in from the factory, conventional/synthetic ? Redline. Best oil because of all 3 micro lubricants, zinc, phosphorus and the best molybdenum. It's 5w30 is crazy high in it and will protect extremely well. $10 a qt though so you'll have to ponie up!